One of the most affordable food trailers on the market, the Troop is a salute to our military: hard working, dependable, and always ready to serve. At 8 feet long and only 660 pounds, a Troop can be pulled by any vehicle with a tow bar. Easily hand-maneuver it into a single parking space or through a disaster recovery situation. The hitch can be removed for both security and safety. Better than a trailer hitch grill, it's an entire kitchen! At only $4,170, you won’t find a lower price on a full-featured mobile kitchen. And with our lease-to-own program, we’re providing the opportunity for anyone to open a business, feed the hungry, or connect with the community. If you can flip a burger, you can run a Troop. A single cook can feed hundreds of people in a day, making it easy to take shifts. Whether used in disaster recovery situations, to feed the homeless, or to make a profit, an OMG connects you to your patrons face-to-face. Each mobile food trailer is hand-built from the ground up in Azle, Texas. We use only high-grade steel from trusted suppliers and our welders are expert craftsmen. Slice it, dice it, and chop it on the attached 32″ x 24″ 1/2″ poly-resin cutting board. So easy to clean and perfect for prep work and plates. Grill, boil, and fry on the 36” Blackstone griddle. It has four independently-controlled 15,000 BTU burners and a removable drip pan. Three 30,000 BTU burners provide heat to the steam table. The five steam tray slots can hold the various sizes of your hotel-size restaurant pans. Keep your prepared food ready to serve in the 16-gauge steel warming box. Holds up to 400 degrees. Great for buns and tortillas. Stack your plates, bowls, napkins, and utensils or any other items of your choice on a pair of removable metal shelves. When used buffet-style, the line begins at the poly-resin serving counter, moves across the steam table wells to the condiment holder, and finishes at the tailgate tray. Show off your brand on the attachable marquee sign with your customized name plasma-cut into one side. Write your menu on the flip-side chalkboard. In contrast to the heat, add three cold wells to hold ice and beverages. This add-on unit, complete with drain, is attached to the rear of the trailer. Wash and rinse in the optional four-compartment sink. A tall divider separates the handwashing compartment. Includes a 9.5 gallon gray water tank. SHIPS IN 14-21 BUSINESS DAYS! Just ordered one, what a great experience it was! Professional and personal care…highly recommend them. An OMG is a must have for a chef. Indoors, outdoors, patio, on the street, you name it, this trailer is amazing! We'd Love to Talk About Your Food, goals, and ideas. Just fill out of the form and we'll reach out ASAP. What's cooking? Please enter a message. What kind of vehicle do you need to pull it? With every trailer under 1,100 pounds, virtually any vehicle with a tow package can pull an OMG. Tabatha pulls her OMG behind a Mini Cooper! However, please check your vehicle’s manufacturing towing recommendations. You can pick any color! Each trailer is powder-coated for durability in any color of your choice, at no additional charge. How long will it take to get it? Each OMG is built from scratch in our Azle, Texas facility. As a general rule, most trailers ship within 14-21 days. Please call 817-382-2728 for current production timelines. How does your lease-to-own program work? With only 10% down, we'll put you on a 12-month payment plan. When 50% is paid, we'll ship your OMG! Everyone is approved, no credit check required. Please see our lease-to-own page, 5% processing fee. Yes, we accept all major forms of payment. Will this pass a health inspection? We have many customers operating successful commercial businesses with their OMG who regularly pass health inspections. However, health codes vary by state, county, and city, and can be vastly different even within the same jurisdiction, depending on what food or drink is being sold. Many nonprofits, government agencies, and companies feeding employees onsite are exempt from these inspections. 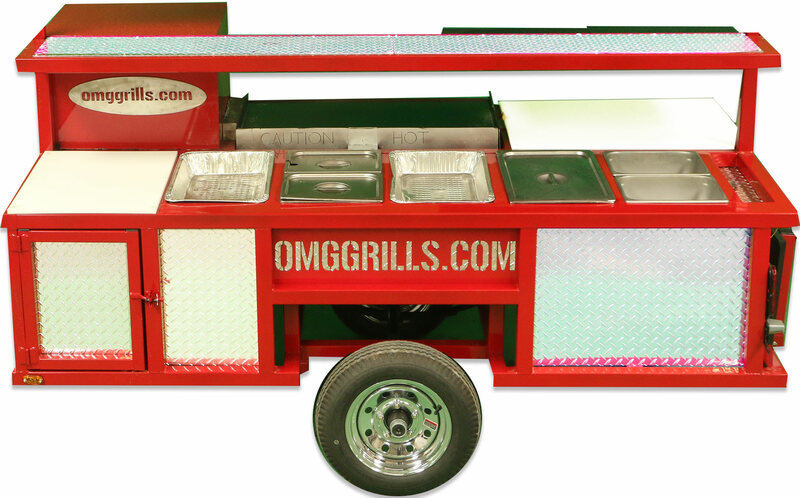 Lightweight and affordable, an OMG can launch your food service business, whether that's onsite catering, setting up in outdoor food courts, or hitting the road to do fairs and show. And with our lease-to-own program, limited finances won't stop your dreams from coming true. What better way to connect with your community than to feed them? Many of our models are GSA-approved. OMGs are used throughout the country by police and firemen, parks and rec departments, and the U.S. military to connect to the community in the way that best meets the situation. Food is one of the greatest ways to connect with anyone, including your employees and customers. Companies across the U.S. are using our outdoor mobile kitchens to forge deeper connections with all of their stakeholders. From churches to schools and athletic groups to disaster relief orgs, our outdoor mobile kitchens have provided nonprofits of every size a way to feed hundreds of thousands of hungry people. Uses vary from fundraising, to community outreach, to feeding the homeless, to being a lifeline to those in a disaster scenario. You put down a 10% deposit and we’ll put you on a 12-month payment plan. Everyone is approved; with no credit check required. There's a 5% fee for using the lease-to-own program. Unlike traditional layaways, you can receive your new grill trailer when only 50% is paid plus the 5% processing fee. You get to start cooking that much sooner! Call us to confirm the model, color, and specifications and we'll begin building your new OMG. The majority of our clients using the plan make the payment from revenue or donations made by its immediate use. NEW! FINANCE WITH NO DOWN PAYMENT, CREDIT REQUIREMENT ONLY 575+! Along with our lease to own program, we've partnered with Rock Solid Funding to provide no-down-payment financing. Apply today by visiting Rock Solid Funding's website and filling out an application. Ready to lease-to-own an OMG food trailer? Contact us to make your deposit. Contact us by calling 817-382-2728 or filling out the form below and we'll reach out to you. If you're not ready to order, call us anyhow, we'd love to chat! We’ll help you decide on the right powder-coating to match your brand colors, select options or add a marquee, and make any customizations for your menu. Once your hand-built OMG is finished, you can either pick up your mobile kitchen at our Azle, Texas facility or we can arrange to have it shipped to you. Any Questions or Comments Please enter a message. Are you looking to utilize our incredible lease-to-own program? Just give us a call 817-381-2728 or fill out this form. While we provide our most popular colors in our visual builder, we can powder coat an OMG in virtually any color, just reach out to us. If you're having issues with the visual builder, please let us know and we'll fix it ASAP.